21 year-old White Stork foraging at our Spring in January 2018. 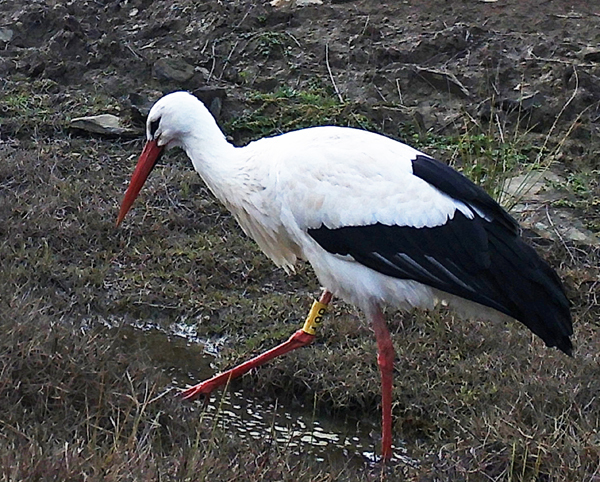 The Above White Stork was ringed in Alentejo, Portugal on 26th May 1997. It visited our Nature Reserve on 6th January 2018. An amazing 20 Years, 7 Months and 11 Days later ! The bird was ringed just a short distance away - around 12 km from our reserve. 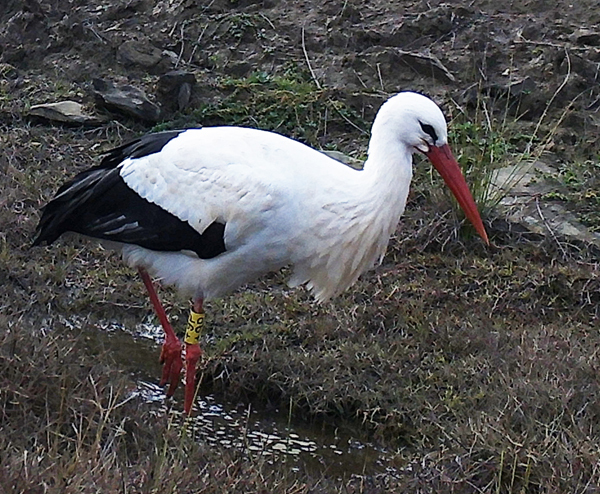 The White Stork was ringed during a project co-ordinated by the Portuguese Bird Ringing Centre (CEMPA - Central Nacional de Anilhagem). 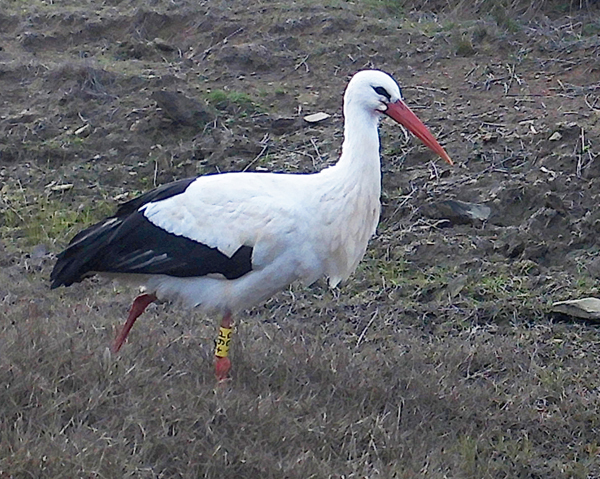 The project relating to this White Stork was identified using the European Colour-Ring Birding website (as described below). What Should I do if I see a Colour-Ringed or Wing-Tagged Bird ? Firstly take notes of the colour of all leg rings and flags and any wing-tags. If there are code numbers make a note of them as well. A series of good photographs of the bird showing these features will be very helpful. 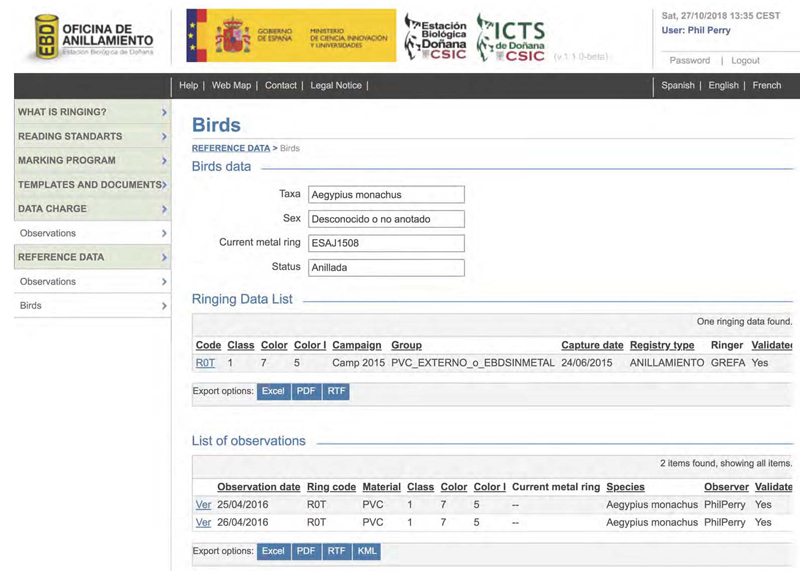 This website, European Colour-Ring Birding makes it easy to identify which project a colour-ringed or wing-tagged bird belongs to. 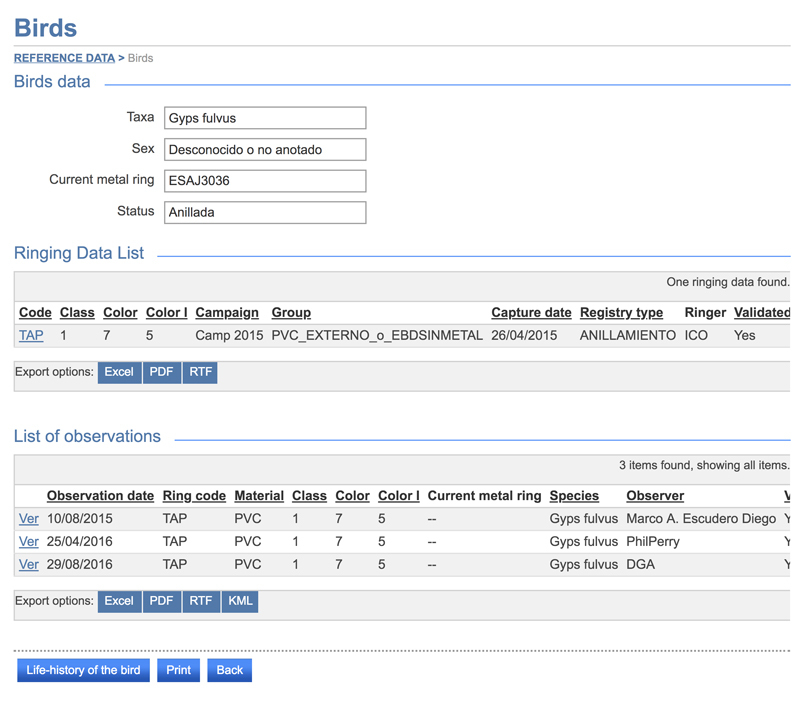 Information needed includes Species, Colour and Number of rings, flags (colour rings with flag-like projections) and wing-tags and colour of the code lettering and so on. This information will identify the project and gives contact details. Then send in your information and someone from the project will confirm that the bird belongs to their project and will then send you information about the life history of the bird. 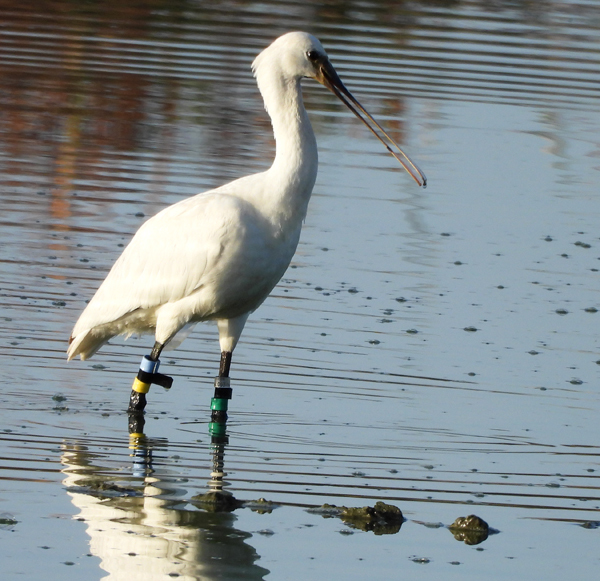 The above Eurasian Spoonbill was ringed as a pullus (nestling) at Krammer-Volkerak, Slaakeiland in the Netherlands on 2nd June 2018. This sighting was made in Alentejo, Portugal on 12th October 2018. So this bird is still a Juvenile. 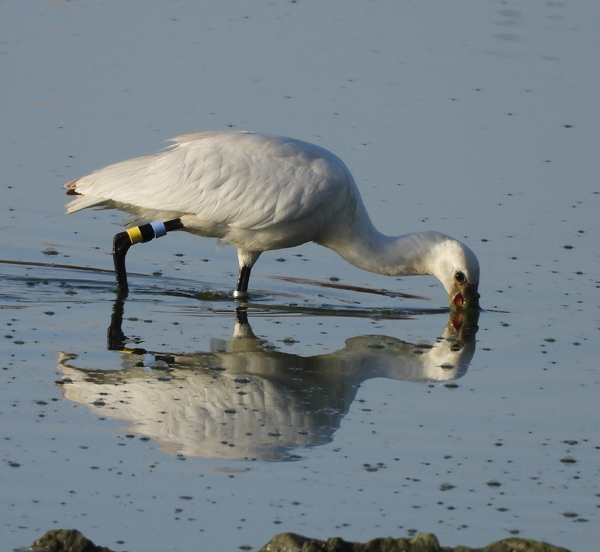 It appears that the Spoonbill stopped in Portugal for a couple of weeks and will then presumably continue on migration to Africa for the Winter. The Spoonbill has several colour-rings and also a black flag. Plus the usual metal ring used by bird ringers. 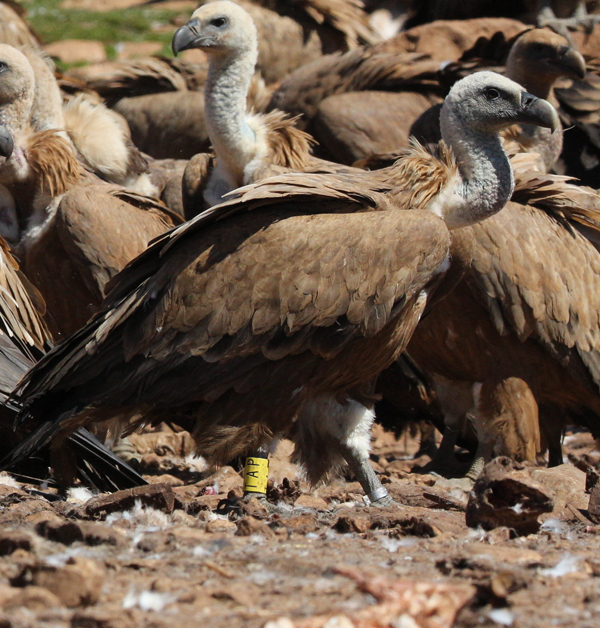 The above Black Vultures were seen by me in Catalonia, Spain. 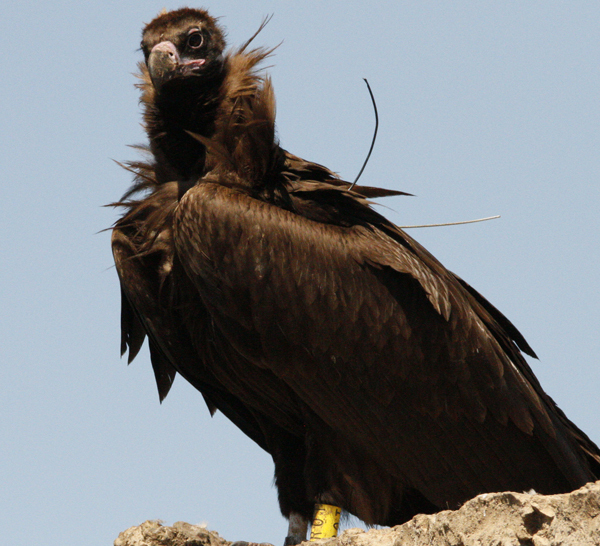 The data below shows the life-history of the Black Vulture with the yellow colour-ring number R0T - as photographed above. I saw it at two different locations on consecutive days. It has a yellow colour-ring with the number (in black) R0T. It also has a metal ring (right leg) as well as a transponder on its back - an aerial can be seen in the two photographs above. The above Bearded Vulture was seen by me in Catalonia, Spain. 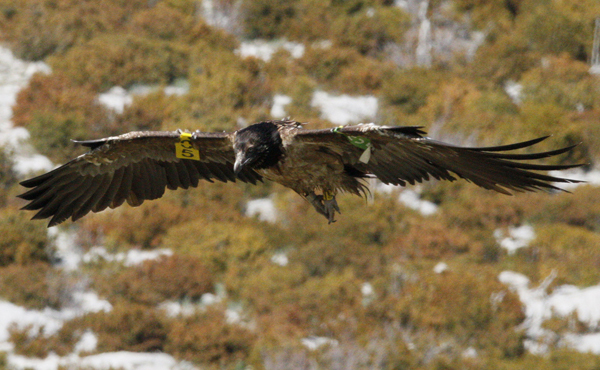 The data below shows the life-history of the Bearded Vulture with two wing-tags (one Green and one Yellow) and a Yellow colour-ring - as photographed above. The Spanish ringing project gave this bird the name Formiga. 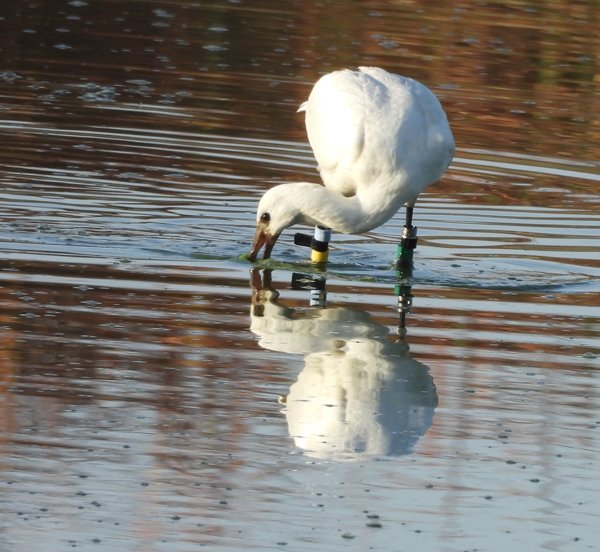 It was ringed as a young bird in June 2015 and I saw it as a Sub-Adult in April 2016. 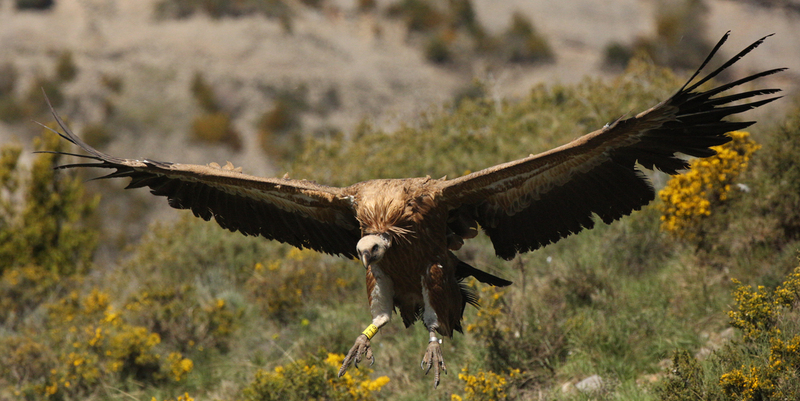 The above Griffon Vultures were seen by me in Catalonia, Spain. This Photograph took a while to match up to a ringing project. The reason for this is that the original wing-tag colour was actually Green. By the time I saw the bird the wing-tag had faded to Blue ! The above Griffon Vulture was seen by me in Catalonia, Spain in April 2016. 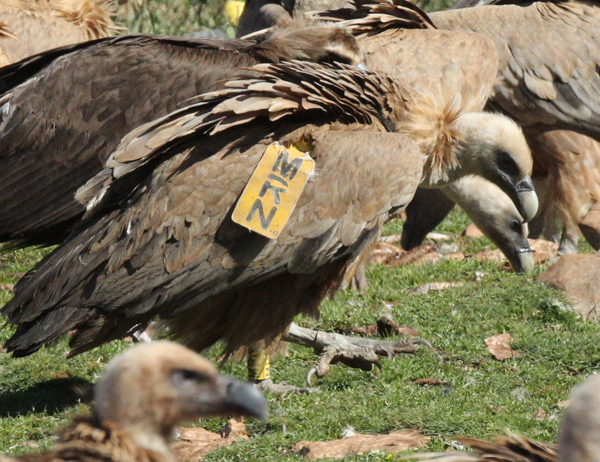 This griffon vulture was wing-tagged in December 2012 in the ZPE of Moura-Mourão-Barrancos in Baixo Alentejo, Portugal. 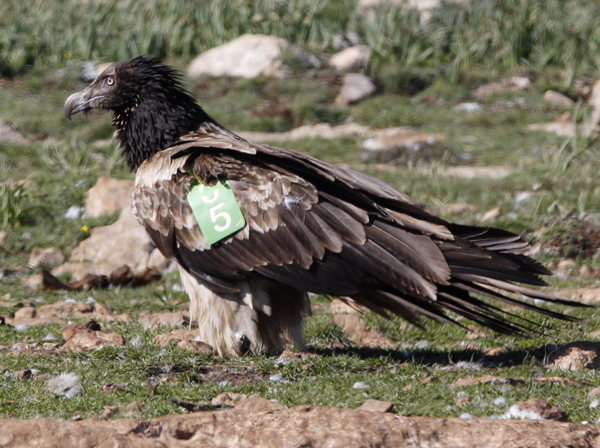 About the difficulty to find this vulture or its tagging program is because the original green tag, with the time and exposure to the weather, sun, etc, changes the colour and the original green colour seems blue, but it its a green tag. 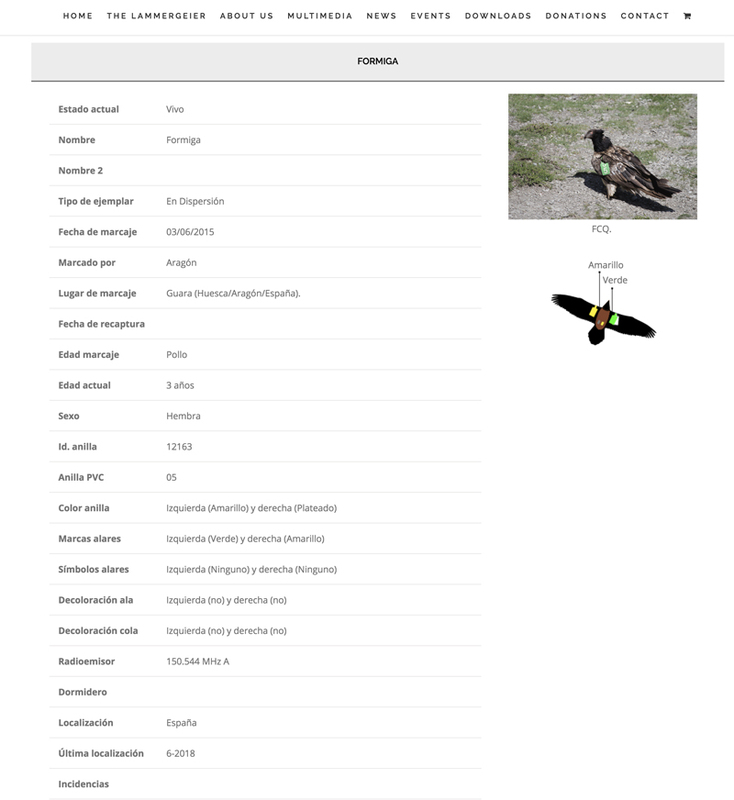 With this additional information, we inform you that this bird was tagged on 21th December 2012 in a vulture feeding station in the protected area of Moura-Mourão-Barrancos in Baixo Alentejo region (Portugal) but close to the border with Spain. After release this bird, we watched it in November and December of 2013 in the same feeding station where it was trapped. In 2014 it was watched in the NP or Aracena y Picos de Aroche (Huelva, SW Spain), few km east of the tagging place. 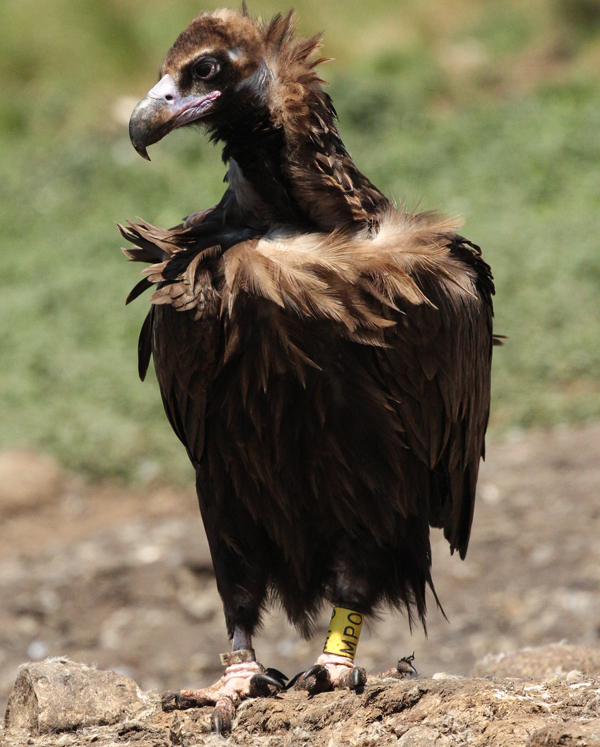 And in October of this year we detected the first long travel, being watched this vulture in the NP des Ecrins (France). 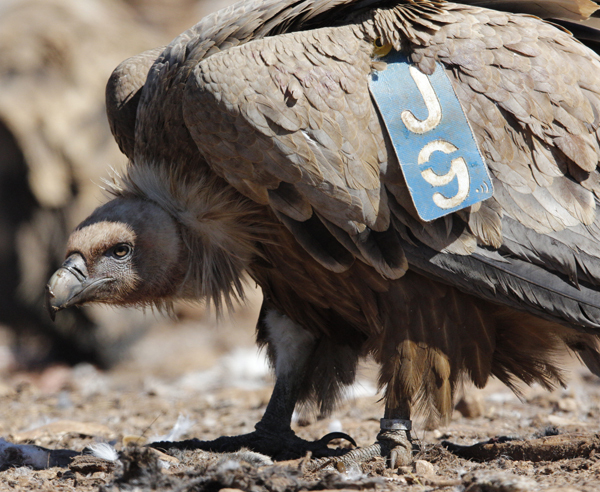 In 2015 was a long distance travel for this vulture and it was found again in a farm in the NP or Aracena y Picos de Aroche (Huelva, SW Spain) in April; in October it was watched in Langedoc-Rousillon (France) and in November again in the NP or Aracena y Picos de Aroche (Huelva, SW Spain). 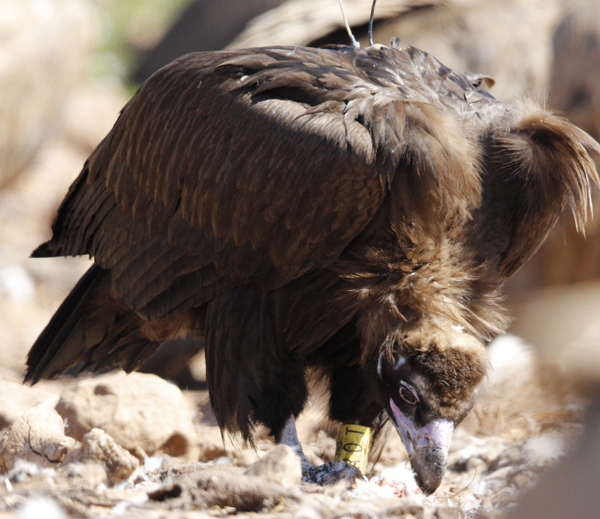 In 2016 the vulture was watched in a vulture feeding station in Huesca (Huesca, N Spain) and later in April, you watched this bird in Lérida province, being the last record we have of this bird. 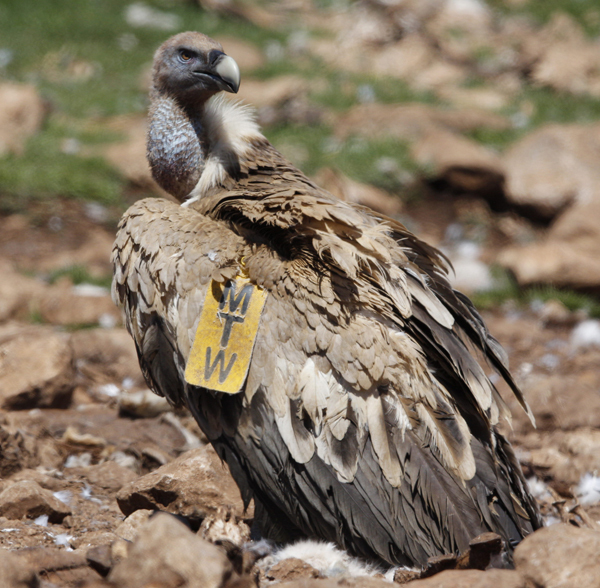 This vulture is one of the vultures tagged by us with more records along this time and we want to thank you for the record and for the excellent photo!! !